Double pin wheel cutting measurements. Thread: Double pin wheel cutting measurements. Please, could anyone provide me with a measurement chart for rotary cut Double Pin Wheel patches? Eleanor Burns has a U-tube video making a 7" finished blocks using 2 x 2.5" (I hope that's the right size) strips sewn together and rotary cut at 45*. I am hopeless at Maths. The method is just right for me but having researched as best I can, I haven't found a chart for various sizes. I plan/need 9" finished blocks to marry in with an Elephant applique design I am making on a baby quilt. Last edited by stitchingcrazy; 06-03-2013 at 02:13 PM. Can you post a photo of the block? If my calculation is right you would need two strips of 3 1/4" wide sewn together. you should get a 9" block (finished). Make a test block first just to make sure. 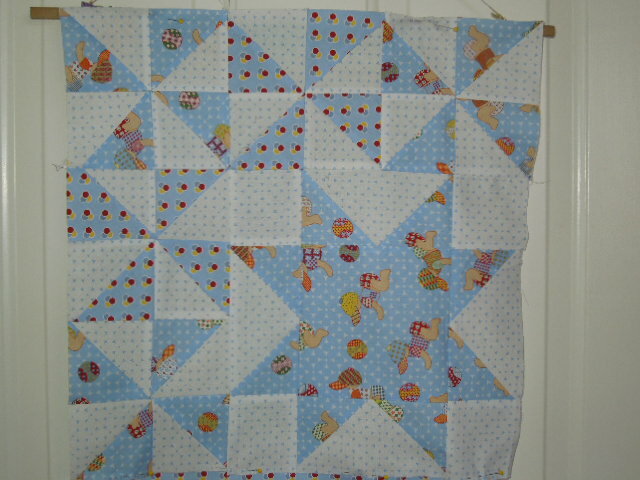 I just made a baby quilt with pinwheels. I used the easy pinwheel method there I stitched around the edges of two squares of fabric then I cut each square from corner to corner (in a X) and pressed open the 4 pieces. I then stitched them together into a pinwheel. They were not the correct size so I cut them down to the size I needed. I've attached a picture of it laid out before sewing all the blocks together. I needed 3 pinwheels to fit around a star and the method I've noted worked for me. Thank you "EasyPeezy" I will try a test one as advised and let you know the result. Thanks to you all for your responses. This place is a great resource for information for those of us less experienced. LyndaOH, the block is shown in the link sent in by "nativetexan" Eleanor Burns U-tube videos was where I saw her strip piecing method. It seemed much more accurate and quicker than doing it "the normal way" so to speak.